6 weeks after the Google+ launch, the project received a major upgrade and added social games. "Games in Google+ are there when you want them and gone when you don't. When you're ready to play, the Games page is waiting — click the games button at the top of your stream. You can see the latest game updates from your circles, browse the invites you've received and check out games that people you know have played recently. The Games page is also where your game accomplishments will appear." The nice thing is that game updates don't clutter your main stream, but this also means that the stream will no longer be comprehensive and it will be difficult for a game to become popular in a short amount of time. For now, there's a small number of games from companies like Zynga, Rovio (Angry Birds), PopCap Games and it's interesting to see that the games APIs aren't publicly available. "We chose to start with a small number of partners so that we could experiment, get the kinks out of our APIs, and get real end-user feedback before opening up to the world. (...) Because we want to provide both a great user experience and a great developer experience, we're focusing on quality before quantity. We will continue to add new partners and new features in small steps, starting with today's release of the games APIs to a small number of developers," explains Google. Games aren't available to all Google+ users because the feature is slowly rolled out. When you see a new tab at the top of the page, next to the search box, you should be able to play games. Google+ games are social. When you play a game, you can share updates with your circles, buy virtual goods, send gifts, invite your friends. "Additionally, a game may involve multiple players in a single match (such as a poker table). In these situations, the other players in the room can see and interact with each other during gameplay. Some games allow you to partner up with (or work against) another player, such as a neighbor, ally, or an enemy/rival. These games use your circles to suggest people to interact with. You could show up as a suggestion to another player to become an ally or to challenge," mentions Google. Forbes reports that Google charges a 5% fee to developers for virtual goods transactions. "With this much lower fee to attract developers, Google is going after Facebook, which takes a 30% cut from developers for using its required Facebook Credits virtual currency system." Google should have come with Pages for business before integrating Games! For me the games button did not yet appear at G+, I guess I will continue to use http://www.findfiles.net/games for a while to come. Games on Google+??? Okay, back to Twitter. No matter how many times it is written, people will still say "OMG, games... I'm leaving!" The Games will be in a separate part of G+ and they won't bother you if you don't want to play. "ZOMG... GAMES!!! I hate you now Google+! You have ruined the very essence of what makes you different. You have decided to capitalize on what is a very lucrative market and I pity the people who still use Google+ because of it." Blah Blah. Of course they're doing games before Business. Business pages don't really provide income and that really is the reason any company does things. I also think they're doing it right by not forcing game stuff onto your main stream. You don't want to see it, don't click Games. Or go back to the outdated and useless Twitter or the overly flooded Facebook. Mweh, Google+ is losing its value imho. It doesn't outplay both Twitter for news or Facebook for social. The only thing it has that both other networks don't have (apart from extended privacy settings) is instant upload. The rest of the service appears to be 'mweh'. In before: zomg hangouts, games! That doesn't cut it. I think games are not problem, but a plus. I am not the player one, but it does not bother me at all, since they are quite well separated. In this way, everybody can be happy: the ones waiting for games and the others. I am interest in games, and play them. Through I have yet to encounter a truly social game that you cant play on your own or use social networks in a innovative way. I am hoping Google will developed some internally that does this or support developers who will do something original with social games. I haven't played Facebook games in over a year, but have friends who do. I have no problem if others like to play the games. In Facebook I block any games that come to my wall, and I like the way Google+ says it won't be putting the games on the Stream. Maybe this is something that will help Google+ to grow, but I do agree that a way to set up Business pages is needed. Once I have installed or run a G+ game, how do I uninstall it? I haven't tried G+ for almost two months now. Anyway, it's a good news for those gamers that they integrate game on the community. Oh well, hope that it doesn't really come to my wall. Indeed, Games do not interfere with non G+ members, people should really read up and investigate a feature as to if they like it or not first then to jump up and down shouting "I'm leaving"
They are in their own separate section and do not interfere with normal social feeds. 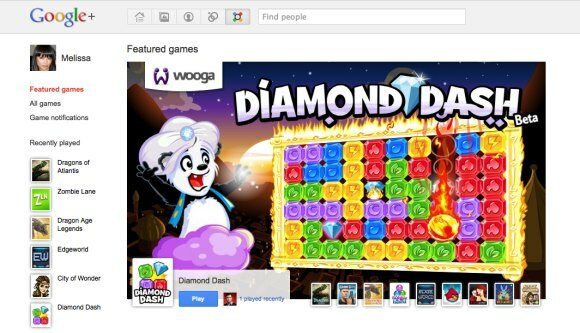 The fact that G+ has integrated games was a good idea, Google still need to pay for it's new social network venture. Also games are a very good reason why Facebook is so popular, Games give people a reason to come back to the site (to play the game) while they are here they checkout their feeds/walls in the process and also post updates. Even for non gamers they are encouraged to use a social networking site that is active. hey! i suggest you should add Tetris Battle in your games.. my friends like it a lot .. they still chose facebook because you don't have Tetris..